One of my favorite visual artists is Lynn Hanson. I love her earthy, moody, naturalistic artwork, but I am also a huge fan of her adorable (and now famous) house in Venice, California. I first saw Lynn’s house in a 2010 article in Country Collectables’ Cottage Style magazine. I found her home so charming, that I kept the magazine, just for the photos of her 1921 bungalow. Whenever I’m cranky, or agitated, or overwhelmed I pick up that magazine and flip immediately to Lynn Hanson’s seaside cottage. It just seems to calm me and transport me to a peaceful, happy place. I scanned all the photos onto my computer, and though it didn’t do the color palette justice, you get a sense of the simple, vintage beauty of her place. Lynn bought her home in 1983 and has been making it her own ever since. 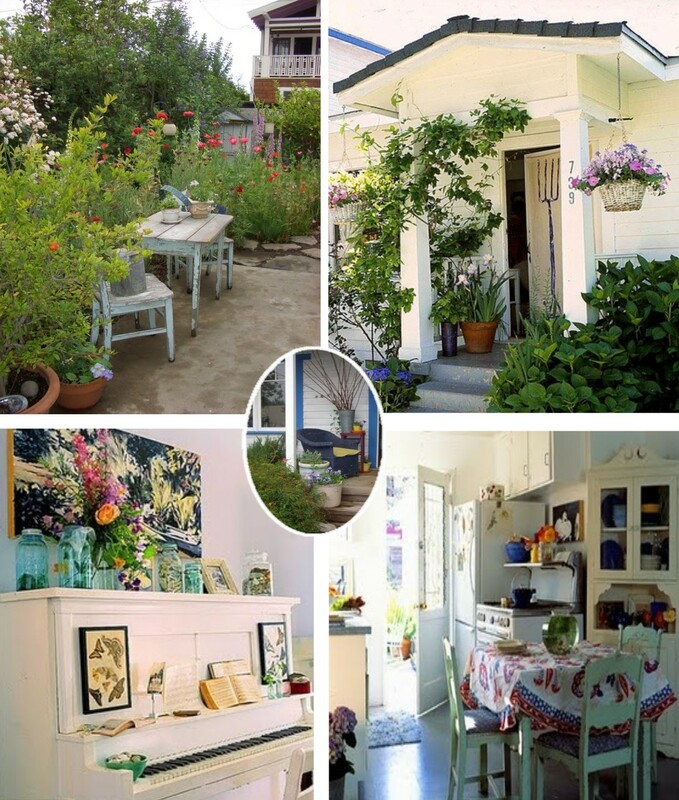 Many other people have taken delight in Hanson’s 762 square foot cottage – it is routinely featured on the Venice Studio Artwalk and Venice Secret Garden tours – and so I was able to find additional public pictures of her house & garden online. The L.A. Times recently did a pictorial of her home. So I thought it would be fun to compare some older pictures and newer pictures side-by-side. The decor (in recent photos) seems to have veered a little more toward sharp primary accent colors, and less pastel, soft blues and sea greens. Both schemes are attractive – I can’t decide which one I like better! You can see in the picture below (of Lynn’s daughter’s room) and a couple of the others above, that Lynn’s artwork has migrated around the house. The loveliness, however, extends far beyond the actual house. 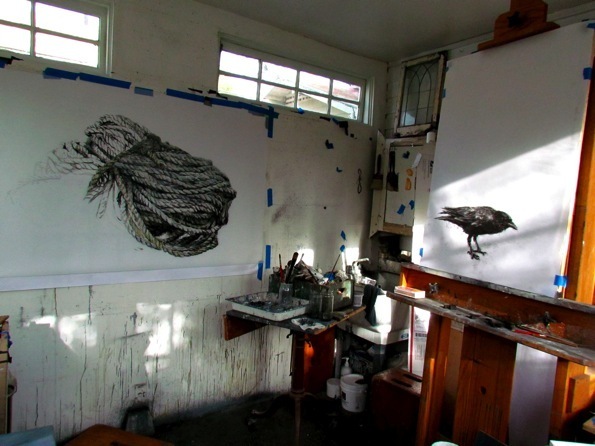 It spills out into the garden and the art studio that Lynn converted from an old carport. For a detailed tour of Lynn’s garden and studio, see the phenomenal photos that Janine Robinson took in May, 2011 – now featured on her blog at: Laguna Dirt. 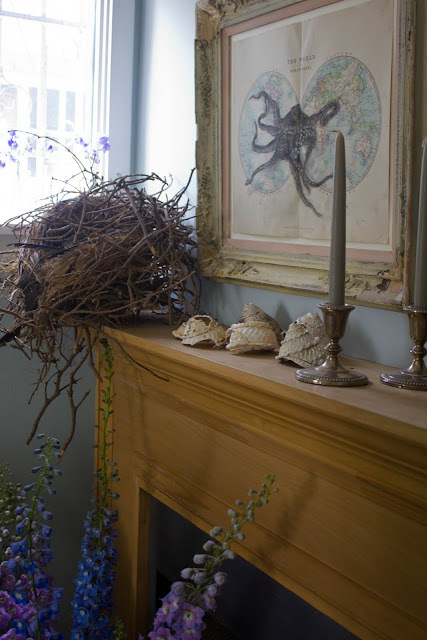 It’s amazing how the natural, ephemeral decor just flows effortlessly throughout Lynn’s entire property. Her airy, beachy cottage is enchanting. Though small, Lynn’s charming bungalow delights one’s senses at every turn. If you would like to learn more about artist Lynn Hanson, see her website here and her blog here.